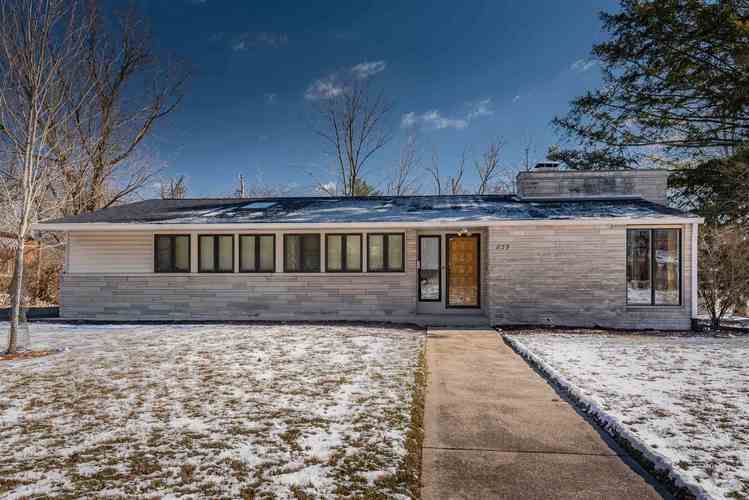 This architecturally unique mid-century home in Elm Heights is just over a half mile from IU, Bryan Park, and Rogers/Binford Elementary. The entry features a half wall planter/bookcase and gives way to the 11’ ceilings in the office. The office has floor to ceiling windows, attractive built-ins, and shares the double-sided gas fireplace with the living room. The main living area is characterized by abundance of windows, parquet flooring, and the handsome limestone fireplace. This space flows seamlessly into the dining area and the sliding doors provide access to the backyard terrace. The kitchen has a new stainless refrigerator and the sellers replaced the gas oven (2013) as well as dishwasher (2013). The kitchen features an adorable built-in eating nook. This 3-bdrm home has a master bedroom with en-suite as well as 2 additional bedrooms that share a large bathroom with a jetted tub and separate shower. Multiple skylights and vaulted ceilings make this home feel bright and airy. Exterior updates include: yard re-sodding, irrigation system installed, and roof replaced all in 2017. Crawlspace was fully waterproofed in 2012 and a new fireplace insert was added in 2013. Home also features a Nest thermostat and AT&T fiber optics. Don't miss this unique opportunity on a special street. Directions:From Maxwell, turn North onto Sheridan Drive. Home is second one on the right, but first driveway on the right.